Rally at Westminster - Calling for Urgent Reform to Dog Law. 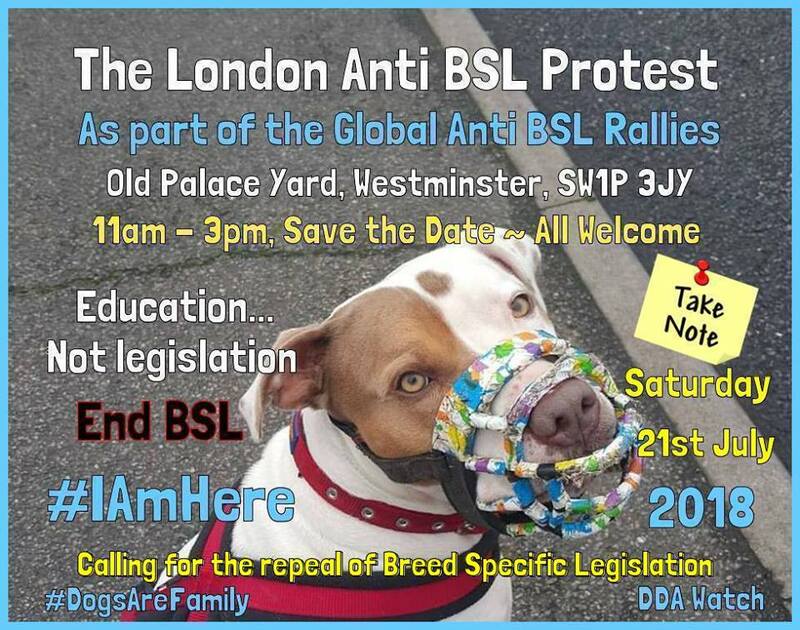 London to take part in Global Anti-BSL Rallies: A Westminster Protest calling for the repeal of Breed Specific Legislation, introduced to the UK in 1991, is taking place as part of the Global Anti-BSL Protests held each year. The London event is organised by DDA Watch Ltd and there are other awareness events taking place in Ottawa, Canada, Germany, Ontario, Canada and Cardiff, Wales. The Westminster peaceful protest takes place on the 21st July at Old Palace Yard, Westminster, SW1P 3JY at 11am to 3pm. Battersea Dogs and Cats Home believe that BSL should be repealed and their evidence states it has been proven to be ineffective at reducing incidence of dog attacks, and it is arbitrary and unfair, and it is not based on scientific fact. Wood Green the Animals Charity stated that the welfare of many dogs has been compromised as a result of this law with thousands euthanised unnecessarily and the Association of Pet Behaviour Counsellors supports the repeal of BSL due to lack of effectiveness and welfare issues. The evidence is overwhelming; it is time to move on to fair and smarter breed neutral dog law. Please Contact DDA Watch for further details.